It’s the most wonderful time of the year but can feel more like a burden than a blessing if you’re playing hostess. 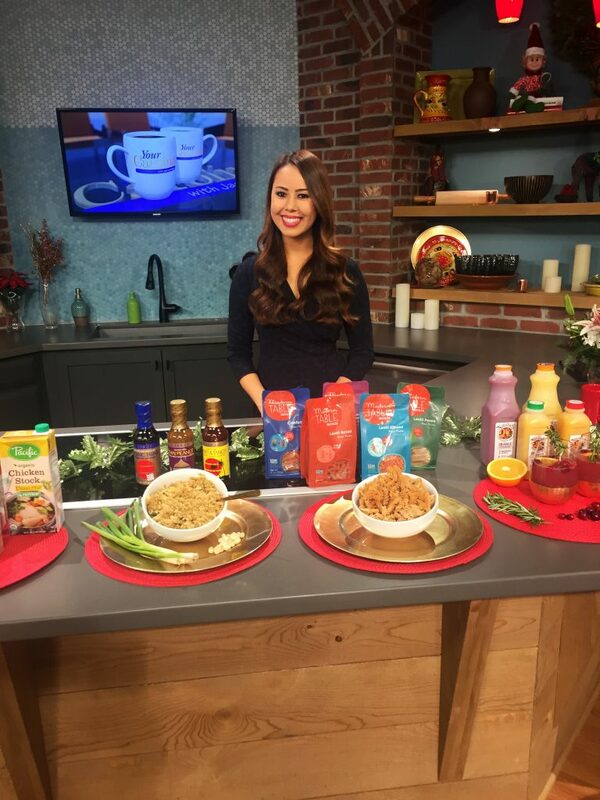 Today on CBS WSPA-TV, I shared some healthy and delicious ways to impress your friends and family this holiday season – without the stress. Watch the segment here! The reason is because broth is very low in calories but adds a lot of flavor and nutrition. I particularly like the Pacific Foods brand because they use simple and real ingredients you won’t find any added sugar or flavorings. Their Chicken Stock and Bone Broth are excellent and definitely staples for so many holiday dishes. Their bone broth has more than double the calcium and 30% more iron than traditional broths! I shared the Gluten-free Tamari and Asian Cooking Sauces by San-J. They offer a variety of authentic Asian flavors in local grocery stores. As a dietitian, I really like that their sauces are gluten-free, especially since most soy sauces are not. It allows you to cater to your guests who may have diet limitation. I shared a cauliflower rice dish made using the Thai peanut sauce on air. It only took me 10 minutes to prepare so it just goes to show how much time you can save in the kitchen by having great cooking sauces on hand. Bean pastas are naturally higher in fiber, protein and iron.They really taste the same so you might be able to trick your kids as well. I shared Modern Table Meals Lentil Pastas. They offer a great variety including the elbows, penne, confetti and rotini. Their pastas are gluten-free as well and they don’t use any artificial colors, flavors or preservatives. When it comes to holiday drinks and cocktails, I recommend sweetening them with 100% juice instead sugar and syrups that way you are getting vitamin C and antioxidants instead of pure carbohydrates. I shared some fresh, seasonal juices by Natalie’s Orchid Island Juice Company. They are excellent because their juices have no added sugar or preservatives – the only ingredient is the fruit that is in them. They are based in Florida and their juices are made to order so you know they are fresh. I used their orange cranberry juice to make a festive holiday punch that’s naturally sweetened by their juice. You can find the recipe here.